Can Running in Place Help Burn Fat? Burning fat to help you lose weight requires dedication to your exercise routine and diet. Cutting down on your calorie intake is half the battle -- and to burn fat, you must also exercise regularly. If the idea of exercising at home appeals to you, a workout such as running in place can contribute to your goal of burning fat. As elusive as fat loss can be, the process behind losing fat is simple. Fat loss requires you to put your body in a calorie deficit, which is the result of burning more calories than you consume during a specific period. It's often possible to reach and sustain this deficit through a combination of exercise and diet -- typically, you must increase the amount you exercise and decrease your calorie intake. Reaching a deficit of 3,500 calories causes the loss of one pound of fat. Regular, up-tempo workouts are an ideal way to burn enough calories to put your body in a calorie deficit. Running in place, provided you perform the exercise frequently and keep your pace elevated, can burn calories rapidly. According to the University of Maryland Medical System, a 135-pound person who runs in place for 30 minutes burns 292 calories. During the same 30-minute workout, a 215-pound person burns 465 calories. Supplementing your running-in-place workout with other forms of cardio exercise can keep your workout from feeling monotonous. But, if you're dedicated to burning fat solely through this form of exercise, the key is to perform it several times per week. The U.S. Department of Health and Human Services exercise guidelines suggest that adults get at least 150 minutes of moderate cardio per week, or 300-plus minutes if you're anxious to build a slimmer body. To meet these guidelines, consider running in place while you watch TV; before you know it, you'll have exercised for an hour. If you find that you enjoy running in place, consider investing in a treadmill for your workouts. 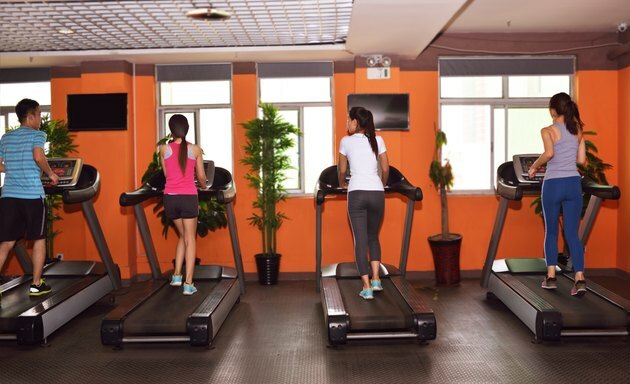 Treadmills provide a similar-feeling workout, but your stride will likely feel more natural. This piece of exercise equipment is ideal because it allows you to customize your workout by adjusting the pace and incline. The treadmill also tracks your distance, speed, heart rate and, in many cases, the calories you burn during your workout. How Much Running Should I Do Per Week to Lose Body Fat? Are Exercise Bikes Good for Weight Loss?